Archaeologists working in Italy have discovered an unusual burial site — a rock has been inserted into the mouth of the buried person, a practice believed to prevent people from rising from the dead. To make matters even more bizarre, the buried person appears to be a child of approximately 10 years. A rock was inserted into the mouth of a 10-year-old to keep the deceased child from rising from the grave and spreading malaria, researchers believe. Credit: David Pickel / Stanford University. Vampires and werewolves may produce successful movies, but in ancient times, people took their mythological monsters very seriously. In several cultures (particularly across Europe), people resorted to so-called vampire burials, which believed to prevent the deceased from rising in the form of a vampire or to prevent an “actual” vampire from returning. These weren’t common by any means, but archaeologists have discovered several examples. Among the practices people resorted to, stuffing a rock into the person’s mouth seems to be the most common. This was also the case at the new discovery. The discovery was made at La Necropoli dei Bambini, or the Cemetery of the Babies, a fifth-century Roman cemetery for children. The necropolis is notable for dating from a period when a massive malaria outbreak swept the area, killing particularly vulnerable people such as children. The skeletal remains, uncovered by archaeologists from the University of Arizona and Stanford University, along with archaeologists from Italy, belong to such a child, who was probably killed by malaria. Excavation director David Pickel says that this discovery offers a unique insight not only into the outbreak itself — but how the people reacted to it. The resident people at the time were quite superstitious — we know this because, alongside the graves of children, archaeologists often discovered things like raven talons, toad bones, bronze cauldrons filled with ash and the remains of puppies which appear to be sacrificed. Previously, the team had also found a 3-year-old girl with stones weighing down her hands and feet, another practice meant to prevent her from rising as an undead. In this case, it seems that people were afraid some children would turn undead and continue spreading the plague. “We know that the Romans were very much concerned with this and would even go to the extent of employing witchcraft to keep the evil — whatever is contaminating the body — from coming out,” Soren said. 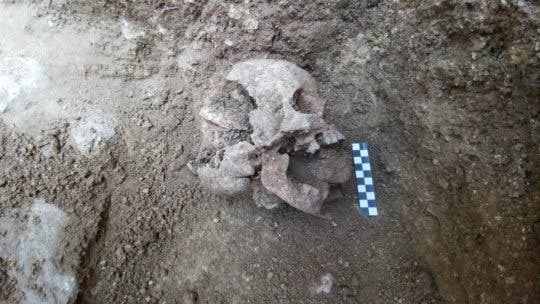 “This is a very unusual mortuary treatment that you see in various forms in different cultures, especially in the Roman world, that could indicate there was a fear that this person might come back from the dead and try to spread disease to the living,” added bioarcheologist Jordan Wilson, a UA doctoral student in anthropology who analyzed the skeletal remains. For now, researchers are set to carry DNA tests on this new find. Next summer, the archaeologists will return to the site and finish excavations and learn more about this dark time of history.